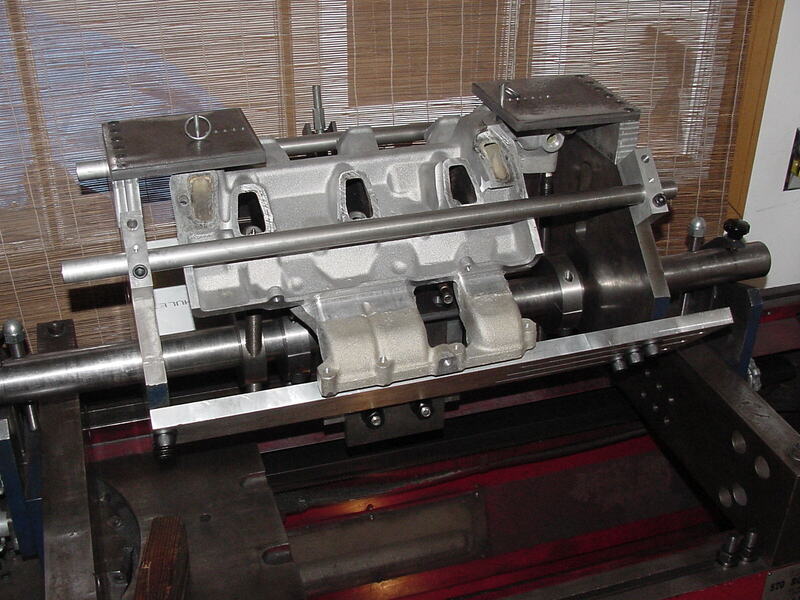 Intake Manifold machining can be a great advantage. My recently Patented Machining Fixture establishes a repeatable centerline and exactly symmetrical cuts side to side in one set up similar to what BHJ tooling does for block machine work. It also holds an intake manifold in tension while being recut simulating some installed forces. A separate intake manifold measuring system consisting of a jig set and calipers determines the proper width to suit each engine. This intake manifold resurfacing fixture has been under development since late 1999. I can provide intake manifold fitting and re machining services for any V series (and many other) manifolds. Please e mail for a price quote. Or I can provide a manifold resurfacing fixture and measuring jig set which can be purchased at pricing similar to BHJ tooling. Also available is a 50 page manual presenting the Universal Manifold Resurfacing Fixture and discussing practical aspects of measuring limits, fitting of bolt holes, reasons for geometry errors, error correction procedures, sealing requirements, and modification of common tooling for doing better manifold work. Updated and expanded in 2006 it is presently available for $25.00 USD. It is printed on heavy paper, bound, including color photos and engineering drawings. It is recommended you purchase and read a manual before calling with a manifold machining request. Order on the west coast by contacting Fowler Automotive by email or telephone 650-969-5559 office or 408-988-6987 shop. East coast orders can be placed through Joe Mondello at his technical school and engine building shop. Call 1-800-MONDELLO We accept PayPal transfers, money orders or cashiers checks. To order a copy of the Manifold Fixture Owner Handbook via PayPal, click below. This manual is NOT just a reprint of old trigonometric formulas and block cutting ratios although that approach to manifold machining is analyzed. This handbook presents new ways of thinking about old problems and how to get better use from tools many shops already own when used in conjunction with the Universal Manifold Resurfacing Fixture and jig measuring system. It has been favorably peer reviewed by Dema Elgin (owner of Elgin Cams, Redwood City CA; Gary Lewis, De Anza College Automotive Technology Dept head (retired); Joe Mondello, and several other nationally recognized participants in the high performance engine building community. Written by a machinist for machinists, it has been discussed with all major manufacturers of automotive engine rebuilding equipment to assure compatibility on virtually all current surfacing machines and many older models in addition to conventional milling machines. Resurfacing a 440 Chrysler "RB" manifold to suit milled heads and decked block at Wightman Engineering Services. Re-cutting a weld repaired vintage Corvette manifold for a restoration job in an older Van Norman broach. Aligning a late model 2.8 liter MPF Cadillac manifold prior to re-cutting sealing surfaces for correction of vacuum and oil leaks. Joe Mondello and his shop foreman inspect a new fixture I installed in his Rottler surfacing machine for the Mondello Technical School. Ford 3.8 Supercharged manifold being re-cut to suit a modified engine and checking bolt hole layout prior to correction cuts at Fowler Automotive's shop in an older Bridgeport clone mill. 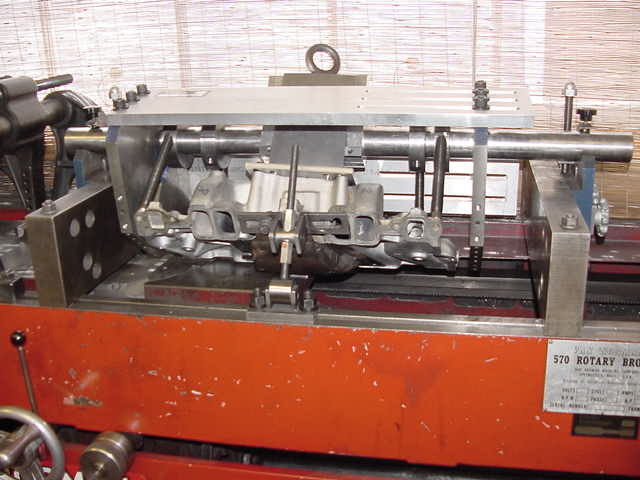 An Intake Manifold Resurfacing Fixture can be configured as a rollover fixture to recut the head side of a sealing surface, then hold the head while being machined for screw in studs and guide plates in one set up. This uses no additional parts or jigs than those supplied with an original fixture purchase. 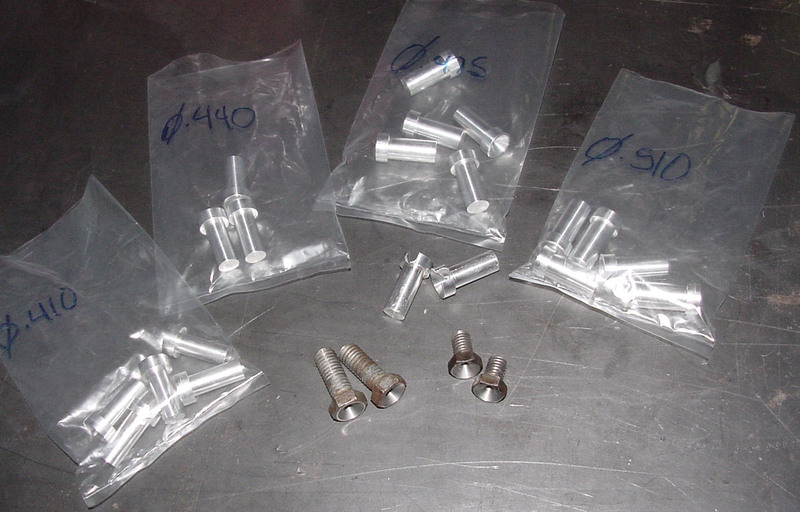 When combined with a BHJ torque plate secured between the head and fixture, which has BHJ's precision located dowel pin option, production runs of corrected and modified heads becomes very fast and accurate. The measuring jig and bolt system is very easy and accurate to use. It can be implemented when the manifold is still in the fixture so a job can be checked at a midpoint to assure a good fit, or after machining for quality control. It can be used just as effectively before a manifold is worked on to pre-plan stock removal.